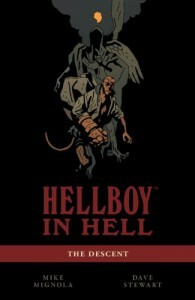 I think the Hellboy comics are going to be something I read in trades. I love reading the story arcs all at once, and going back over and over to check out the art. As an aside, if you haven't checked out Mignola's concept art for Disney's Atlantis yet, go see it. Really cool stuff. I find myself in a tough place, reviewing these. If I try to explain the story, it would take the fun out of it just a bit. Creepy puppet show versions of Ebeneezer Scrooge and Jacob Marley, Hellboy's half-brothers, the princes of Hell fleeing before him, the army that would be commanded by HB's red right hand...suffice it to say there's tons of cool stuff to see. And if it doesn't tell a super-cohesive story, well, I can forgive him that as the art is amazing. 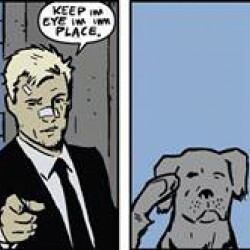 Mignola, with colorist Dave Stewart, can evoke so much from a single panel. Love it.